US Caught in The Big Lie: ThisCantBeHappening! was Correct in Exposing Raymond Davis as a Spy - This Can't Be Happening! Now both the Guardian newspaper in the UK over the weekend, and the Associated Press today are reporting that sources in both the Pakistani and American governments are confirming that Davis works for the CIA. The AP is even reporting that he is a “CIA security contractor,” which is something less and a little more amorphous than a CIA employee, and that means he has no claim on diplomatic immunity whatever, and that raises the added question of who he actually is and who he actually works for. But more on that later. America’s and the President’s reputations lie in tatters as a result of the handling of this bloody incident. Not only did the US dispatch to Islamabad members of Congress, including the oleaginous Sen. John Kerry (D-MA), as well as the reprehensible Secretary of State Hillary Clinton to press for Davis’s release, threatening the withholding of aid to Pakistan (our ostensible ally in the Afghanistan War!). It provided a patently false document to the Pakistani Foreign Office claiming Davis to be an employee of the US Embassy in Islamabad (which would have meant he’d have immunity from arrest and detention), when he was actually working out of the Lahore Consulate, where he would not be entitled to any immunity for his actions). It also tried to exchange his regular passport for a diplomatic one a day after his arrest, again retroactively trying to get him immunity from prosecution for his murderous acts. Furthermore, the US government, according to the Guardian, induced major US news organizations to hide what they knew about Davis’s real role from the American public. The paper reported that several US news organizations had also learned on their own that Davis is a spy, but then voluntarily withhheld the information from the American public “at the request of the Obama administration,” which preferred to stick to the fictional story line that Pakistan is holding an American “diplomat” in “violation of the Vienna Convention” on diplomatic immunity. In fact, on Feb. 15, when the president lectured Pakistan about releasing “our diplomat” Davis, saying “We’ve got a very simple principle here that every country in the world that is party to the Vienna Convention on diplomatic relations has upheld in the past and should uphold in the future, and that is, if our diplomats are in another country, then they are not subject to that country’s local prosecution,” not only did he know he was lying, but so did some major news organizations which ran his statement but didn’t tell readers the truth: Davis was no diplomat, but was a spook, or a contractor for a spook agency. Update Even late today, when the NY Times finally says it got “permission” from the government to publish what it knew–that Davis “worked with” the CIA, it still fudged the issue of its allowing President Obama to lie at his press conference. “Without describing Mr. Davis’s mission or intelligence affiliation, President Obama last week made a public plea for his release,” the self-described “paper of record” wrote. But that’s not what Obama did. He simply lied and called Davis a “diplomat” and demanded his release, claiming he had immunity, and the Times knowingly let him get away with that lie. Readers of ThisCantBeHappening! will not be surprised about any of this however. 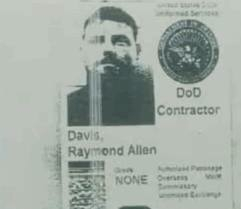 Davis reportedly spent 10 years in US Special Forces until allegedly leaving in 2003, but apparently it has become increasingly common for the US to use Special Forces personnel in countries all over the world who are “off the books” in terms of being registered as active duty at the Pentagon, with records of their service being maintained only at the unit level. The thing is, while it is commonplace in the international diplomatic world for embassies to give diplomatic cover to members of their intelligence services, giving active-duty military personnel diplomatic such “cover” would be a grave violation of international diplomatic protocol. And since local Pakistani politics make it unlikely that the ruse of trying to call him an embassy employee, rather than a Lahore Consulate employee will work with the Pakistan court, it could be the US government has decided now to fall back to claiming he’s CIA, which would probably at least spare him a hanging, even if it leaves him with a long jail sentence in a Lahore prison. My main reasoning for thinking Davis is in Special Forces is that CIA agents don’t typically advertise themselves as being in the “security” business. Yet Davis was carrying cards when he was arrested after slaughtering two Pakistanis that identified him as an employee of Hyperion Protective Services, LLC. That kind of thing may well be what a cowboy secret Special Forces commando might do, but not a CIA agent. Furthermore, the kind of killing that Davis was involved in–the daylight execution on a crowded street of two young men on motorcycles–and the equipment police found in his car, which included multiple semi-automatic pistols and high-capacity clips, a telescope, a forehead-mounted infra-red flashlight, multiple cell-phones, a cell-phone locater, clippers, military knives, makeup and masks and a camera filled with photos of schools (common targets for bombings in Lahore and other Pakistani cities)–sound dirtier than the typical CIA fare. Adding to the suspicion that Davis is involved in something more than just spy work or intelligence gathering is the report in today’s NY Times that he “has worked for years as a C.I.A. contractor, including time at Blackwater Worldwide, the private security firm (now called Xe).” It’s easy why the American government has been trying so hard to keep their Pakistani police and prosecutors from applying the thumbscrew and waterboard to this particular prisoner! Two things are clear already though. One is that the US is a thoroughly untrustworthy member of the international diplomatic community. It has shown that, from the President on down, it is ready to bald-facedly lie to its own allies to cover up its nefarious activities, which well could include fomenting terror within their borders. The other is that the US media are nothing more than propaganda mouthpieces for that same wretched government, ready to help it cover up its crimes when asked. Next PostNext Send a Pizza to Protesters Fighting the Republican Assault on Labor Rights in Wisconsin!